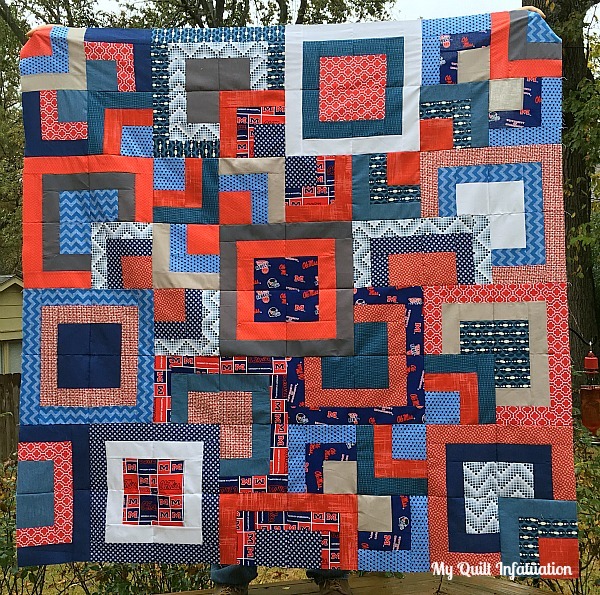 Well a few of my latest quilts, namely my two Ole Miss quilts and my LSU Love quilt, have prompted another friend to ask for a team quilt for her son- 'tis the season for gifts, you know! She asked for the Stacked Squares pattern for the quilt, and only wanted a tiny bit of team fabric (fine by me!). She was also open to the addition of a few more colors than just the traditional red and navy to add some dimension. Ole Miss sometimes wears retro helmets that are actually powder blue rather than navy, and occasionally the team sports shades of gray as well, so I incorporated those colors in the design, and I really love the depth it added to the quilt. As I mentioned before, the season for gift sewing is in full swing, which means that I am also working on a couple of secret projects. It's always tough for me to keep these kinds of projects off of my blog (I am the worst secret-keeper), but at this time of year, there's just no way around it! 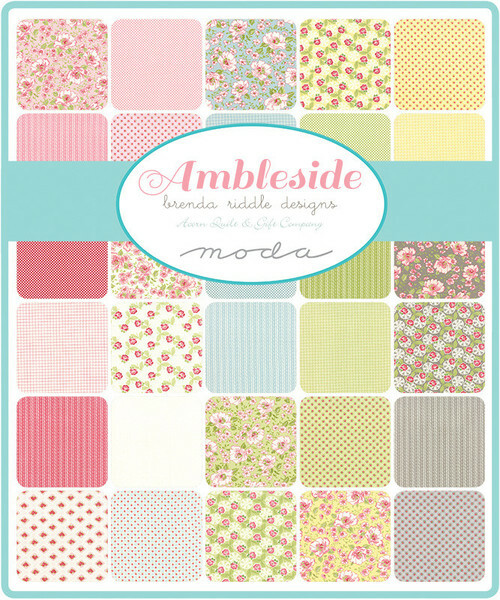 Another thing I can share though is that I just got a full fat-quarter bundle of the Ambleside collection, and I have a great plan for these sweet colors as soon as I finish up this latest quilt. This pattern seems perfect for any color scheme thrown its way! Great job! I agree with Little Black Cat Quilting. I'd love to do this in green and gold for my Baylor Bears! If you need another team quilt idea, I did a baby quilt in Aggie prints. I placed them into a heart pattern and used a neutral background. Turned out to be a really cute baby quilt and a fast sew. That came out great. I love that pattern for a quick finish. Great job! I definitely need to try this pattern. It's so striking. Its great to see a pattern in various color schemes. This pattern is striking. Love the stacked squares! I'm looking hard at this pattern for one of the graduation quilts I'm making.